When the existence of a strain of plague (vaguely identified as pneumonic) is revealed at the US mission at the International Health Organization, three terrorists seek to blow up the US mission. Two of them are shot, one mortally, by security personnel but one escapes. The surviving terrorist is hospitalised and quarantined and identified as Swedish. Dr. Elena Stradner (Ingrid Thulin) and US Colonel Stephen Mackenzie (Burt Lancaster) (Military Intelligence assigned to the IHO) argue over the nature of the strain, which Stradner suspects is a biological weapon but which Colonel Mackenzie claims was in the process of being destroyed. Mackenzie understands that the bridge might collapse as the train passes over it. The presence of the infected terrorist, and the rerouting of the train, precipitates the second conflict, among passengers on the train; they include Dr. Jonathan Chamberlain (Richard Harris), a famous neurologist, his ex-wife Jennifer Rispoli Chamberlain (Sophia Loren), and Nicole Dressler (Ava Gardner), the wife of a German arms dealer. She is embroiled in an affair with her young companion Robby Navarro (Martin Sheen). Navarro is a heroin trafficker being pursued by Interpol agent Haley (O. J. Simpson), who is travelling undercover as a priest. Mackenzie informs Dr. Chamberlain of the presence of the terrorist, who is found, but attempts to remove him via a helicopter are unsuccessful because the train enters a tunnel. Chamberlain is also told that the plague has a 60% mortality rate. Mackenzie, however, informs passengers that police have received reports of anarchist bombs placed along the rail line, and that the train will be rerouted to Nuremberg. There the train is sealed with an enclosed oxygen system and a US Army medical team is placed aboard, with the now-deceased terrorist being placed in a hermetically-sealed coffin. Dr. Chamberlain learns of the risk of the Cassandra Crossing. He also begins to suspect the disease is not as serious as originally thought: few of the passengers have become infected and few of those have actually died. He radios MacKenzie suggesting the infected portion of the train be uncoupled and isolated, but MacKenzie, acting under orders, has no intention of stopping the train: if, as expected, the Cassandra Crossing collapses, it will neatly cover the fact that the U.S has been harbouring germ warfare agents in a neutral country. Passengers on the train work together to stop the train before it reaches the Cassandra Crossing. The passengers manage to seize the back half of the train roughly one km before the bridge and detach it, hoping that with less weight the front half will cross safely. But the bridge collapses, killing everyone aboard the front half. Max, the train's conductor, applies the manual brakes and stops the remaining cars just before reaching the downed bridge. The survivors soon evacuate the remaining cars and head off on foot, no longer under guard or quarantine. In Geneva, both Stradner and MacKenzie depart: she keeps hope of survivors while he feels quiet guilt over the whole affair. After they leave, Major Stack informs MacKenzie's superior that both the colonel and the doctor are under surveillance. The Garabit Viaduct arch bridge was used to represent the condemned "Cassandra Crossing". The Cinecittà studios in Rome were chosen for interiors, with French and Swiss locales providing most of the location footage. The steel arch bridge depicted in the film is actually the Garabit Viaduct in southern France, built from 1880 to 1884 by Gustave Eiffel, who later constructed the Eiffel tower. At the beginning of the film passengers arrive at Geneva railway station to embark on the train. The scenes were shot at Basel central station. Where Dr Chamberlain enters the station, the green coloured trams (belonging to the Basel public transport company BVB) and Basel's Central Station Square can be seen in the background. Much of the film's special effects involved models and rear screen work that was largely effective, although the studio artwork shows a typical US diesel locomotive that doesn't resemble anything seen in the film. Peter O'Toole was offered the lead role, but he turned it down. Richard Harris played the part instead. The Cassandra Crossing was only the second film made by Lee Strasberg. Ava Gardner said "the real reason I'm in this picture is money, baby, pure and simple." Tom Mankiewicz, who worked on the script, dubbed the film "The Towering Germ". The film holds a score of 29% on Rotten Tomatoes based on seven reviews. Richard Eder of The New York Times called the film "profoundly, offensively stupid," with Ava Gardner "awful in an awful role" and Sophia Loren "totally miscast." Gene Siskel of the Chicago Tribune gave the film 1.5 stars out of 4 and called it "an unintentional parody of a disaster film. The catastrophes that befall the passengers of a Geneva to Copenhagen train in the picture are positively ridiculous." Variety dismissed the film as, "a tired, hokey and sometimes unintentionally funny disaster film in which a trainload of disease-exposed passengers lurch to their fate." Kevin Thomas of the Los Angeles Times called the film "a disaster picture quite literally disastrous and so awful it's unintentionally hilarious." Gary Arnold of The Washington Post wrote, "Cosmatos is an absentminded, huffing-puffing director who seems to keep hoping we'll overlook his frazzled continuity, which suggests an old serial slapped together in such a way that the cliffhanging bits are never resolved." 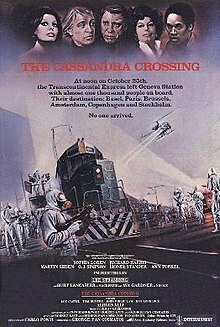 Richard Combs of The Monthly Film Bulletin wrote, "The one remotely enjoyable aspect of The Cassandra Crossing is that it knows no proportion in anything—from performances through plotting, shooting style and special effects, it is constantly outdoing itself in monumental silliness." The film was booed and hissed at preview screenings by critics. The graphic scenes of the passengers being killed at the end of the film had ensured an "R" rating in theatres and led to two "censored" and "uncensored" versions being released for broadcast and home media. The Cassandra Crossing, however, still made money. The producers claimed that they recouped the production costs of the film out of Japan alone. ^ a b Walker 1985, p. 197. ^ a b Tuohy, William. "Ava Gardner: Still that certain something." Los Angeles Times, 9 May 1976, p. s1. ^ a b c d Thompson, Nathaniel. "The Cassandra Crossing (1976)." Turner Classic Movies. Retrieved 3 February 2012. ^ Verlhac and Dherbier 2008, p. 12. ^ "Credits: The Cassandra Crossing (1976)." Turner Classic Movies. Retrieved 3 February 2012. ^ Billington 1983, p. 92. ^ "Travelling in Switzerland." myswissalps.com. Retrieved 3 February 2012. ^ Mankiewicz and Crane 2012, p. 178. ^ "The method man." The Guardian 29 March 1976, p. 8. ^ "The Cassandra Crossing". Rotten Tomatoes. Retrieved December 18, 2018. ^ Eder, Richard (February 10, 1977). "'Cassandra Crossing' Doomed By Silly Premise, Miscasting". The New York Times. 48. ^ Siskel, Gene (February 21, 1977). "'Cassandra Crossing' on tracks of disaster". Chicago Tribune. Section 4, p. 8. ^ "The Cassandra Crossing." Variety, 31 December 1976. ^ Thomas. Kevin (February 9, 1977). "'Cassandra' Rides the Rails". Los Angeles Times. Part IV, p. 16. ^ Arnold, Hary (February 10, 1977). "A Clumsy 'Cassandra Crossing'". The Washington Post. 60. ^ Combs, Richard (July 1977). "The Cassandra Crossing". The Monthly Film Bulletin. 44 (522): 142. ^ Beck, Marilyn. "Director gets cross at 'Crossing' critics." Chicago Tribune, 19 January 1977, p. a6. ^ Grade 1987, p. 246. Billington, David P. The Tower and the Bridge: The New Art of Structural Engineering. Princeton, New Jersey: Princeton University Press, 1983. ISBN 978-0-691-02393-9. Grade, Lew. Still Dancing: My Story. New York: William Collins & Sons, 1987. ISBN 0-00-217780-3. Mankiewicz, Tom and Robert Crane. My Life as a Mankiewicz. Lexington, Kentucky: University Press of Kentucky, 2012. ISBN 978-0-8131-3616-5. Verlhac, Pierre-Henri and Yann-Brice Dherbier. Sophia Loren: A Life in Pictures. Brighton, UK: Pavilion, 2008. ISBN 978-1-86205-831-6. Walker, Alexander. National Heroes: British Cinema in the Seventies and Eighties. London: Harrap, 1985. ISBN 978-0-7528-5707-7.